Senator Jerry Hill, D-San Mateo County/Santa Clara County, honored longtime Menlo Park resident Dan Hilberman, PhD, as the winner of Hill’s annual “Oughta Be a Law…Or Not” contest and the inspiration behind Hill’s legislation, Senate Bill 589, which enables voters who cast their ballots by mail to confirm that their votes were counted. 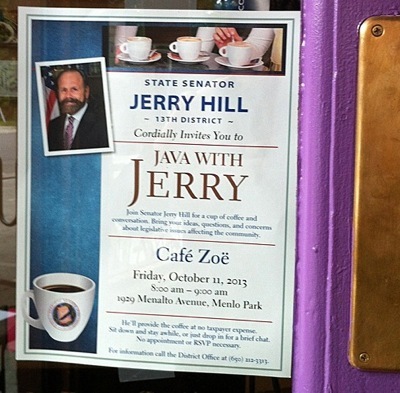 Hilberman was recognized publicly by Hill last Friday (10/11), during the Senator’s “Java with Jerry” community coffee meeting at Café Zoë in Menlo Park. Hill presented a copy of the legislation and a certificate of recognition to the winner of the “Oughta Be a Law…Or Not” contest. Senate Bill 589 requires county election officials to establish a system allowing individuals who vote by mail to learn if their ballot was counted and, if it was not, why it wasn’t. It also provides county registrars with flexibility to determine how they want to comply with the legislation by notifying voters on a walk-in basis, over the phone, or online. The legislation — co-sponsored by Assemblyman Kevin Mullin, D-South San Francisco — was inspired by the winner of Hill’s annual “Oughta Be a Law…Or Not” contest, which invites ideas for new legislation and suggestions about laws that no longer serve a good purpose and should be taken off the books. “I started using absentee ballots in the mid-90’s when I was doing a lot of international business travel, but kept it up for the convenience,” Hilberman emailed InMenlo. “As I saw recent efforts in many states to restrict early voting, early registration and ‘purging’ voting lists, I became curious about whether my own ballots were valid and counted. “One day when Senator Hill asked for ideas, I wrote about my concern. I am delighted that he saw this as a state-wide problem and did something about it. Secretary of State Debra Bowen, the California Association of Clerks and Election Officials and Common Cause California supported SB 589. The bill unanimously cleared the Senate and the Assembly in August. Governor Brown signed the legislation on September 9. It takes effect January 1, 2014.